One of the most sacred Islamic occassions, Ramadan is observed during the ninth and holiest Islamic month of the same name, a time when the great Prophet Muhammad was said to have received the knowledge of Quran. 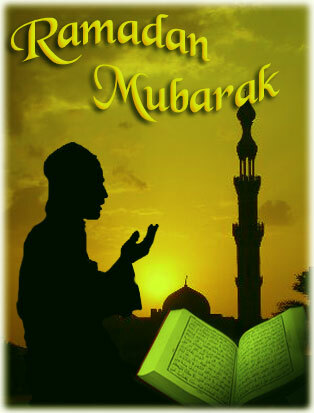 This hallowed event is marked with fasting, eating small meals in groups, prayers, penitence, self-denial and good deeds. TheHolidaySpot aims to celebrate Ramadan in its true flavor by bringing you a befitting section on the festival that consists of beautiful e-greeting cards to send festive wishes to your dear ones, awesome wallpapers themed to the occassion, a collection of informatory articles on various aspects of the event and more! Go through this fabulous Ramadan section and have a holy time! Ramadan Mubarak! Learn the religious significance of the ninth Islamic month Ramadan and the Muslim way of its observance. Go through the story of the fascinating origin of the holy occassion popularly known as Ramadan. Check these wallpapers themed to Ramadan. Set these on your PC screen or even send to dear ones as gifts. Send warm festive wishes to your loved ones with these exquisite e-cards dipped in the spirit of Ramadan. Know how fasting, an important tradition of Ramadan, is strictly practiced during the entire ninth month. Give your desktop a spiritual look with these elegant Ramadan themed screensavers. Learn all about Muhammad, the holy prophet who founded the Islamic faith and showed the true way to mankind. Try these savory recipes at home and serve up delicious dishes to yourself and your dear ones during Id-ul-Fitr. Try this exciting quiz based on Ramadan and check your awareness of this holy Islamic occassion. Make marvelous crafts themed to Ramadan. Let your creative juices flow with these stepwise craft instructions. Personalize and send any of these fantastic gift items to your loved ones and make their Ramadan memorable. Learn about Shahada, Salat, Zakat, Siyam and Hajj - the five essential duties that all true Muslims must perform. Know all about the Islamic calendar and the significance of Ramadan, the ninth month in this system. Know how the holy occassion of Ramadan is observed for an entire month by devout Muslims across the world. Explore this fantastic section on 'Eid ul-Fitr' and culminate your Ramadan festivities. Read these beautiful and sacred quotes related to Ramadan from the holy Quran. Familiarize yourself with Ramadan celebrations in different nations of the planet. Try out these fun-filled puzzle activities and have an enjoyable time on this Ramadan. Know about some interesting facts about ramadan. Learn about how iftar is preformed during Ramadan. Here are some Ideas on Ramadan decoration. Introduce yourself to the Quran, the most sacred scripture in Islam that is said to contain divine rules. Know about the different prayers that are being said on various occasions amid the month long celebrations of Ramadan. Find out for yourself what are the rules of fasting and your fasting can get nullified.